SCO and their recent filing for Chapter 11 Bankrupcy has generated quite a bit of buzz on various news websites. Starting several years ago, they attempted to extort money from EVERY Fortune 1500 company who used Linux in any form, in an effort to keep their company afloat. They sent letters with veiled threats of legal action, and demanded licenses for “their” code which is inbedded in Linux. Tt was actually proven that Novell owns the code that SCO was claiming was theirs. They’ve been in headlines ever since they started lawsuit mongering. Even after years of legal battles, they failed to prevail in the courts, and when I recently visited SCOs’ website while looking for a press release from the CEO, I noticed something immediately. 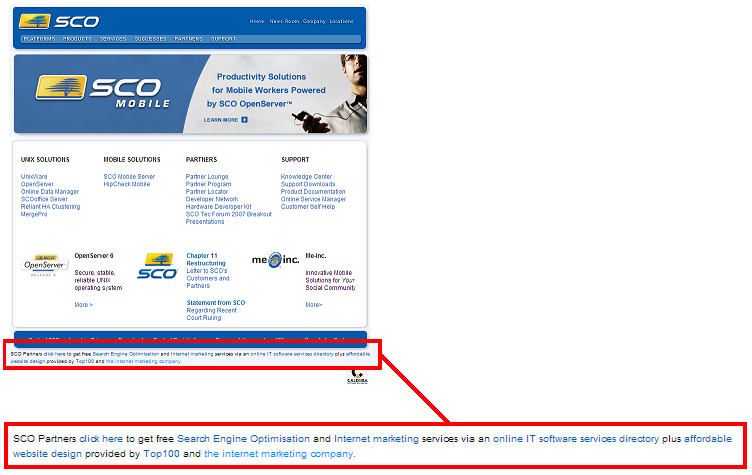 Why are there links for Search Engine Optimisation (or SEO) and website design on the footer of www.sco.com? SCO is a business built on selling hardware and software, not SEO or web design. They’re selling paid links in the footer of their homepage. Talk about being hard up for cash! I’m sure if they ever liquidated their assets, SCO.com would be sold for probably hundreds of thousands of dollars, but selling links on the footer? SCO recently was delisted from the Nasdaq stock exchange, this type of behavior is highly frowned upon by Google. Perhaps being delisted from Google search results is next for this failing company. Paid referral links on the SCO website undoubtedly sell for somwhere between 500 and 1500 dollars a month, probably just enough to pay the bill for their website bandwith usage. Those links likely draw plenty of traffic and those links also raise the Page Rank of the websites that are linked from there. The SCO homepage has a Page Rank (PR) from Google of 8/10, which is VERY high. For example, Digg and Engadget are also ranked PR 8, which means they have authority, and sites they link to must be quality content. Being the good netizen that I am, I reported this to Google via their Paid Links Submission Form. From what I’ve been reading, Google highly frowns upon paid links, and penalizes those who provide and utilize paid linking services. If you’re like me, you would want to find out who is buying these links. Most of the links point to a website theinternetmarketingcompany.co.uk. 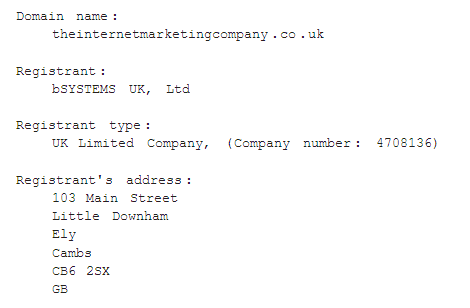 When we run a WHOIS Lookup on that domain, the owner is listed as bSYSTEMS UK, Ltd.
We’ve got the name of a company, that is certainly a start to finding out who is behind these text links. Let’s do a Google search on these folks and see who this really is. Well, well! Seems that bSYSTEMS is actually a SCO reseller in the UK. Talk about finding a vein of search engine gold! I couldn’t think of a better company that could be buying links on the SCO website. The only SCO reseller in the United Kingdom hasn’t been having enough business, so they have transitioned into another line of business – web design and SEO. Hell, if I were a SCO reseller I’d be jumping ship too right about now, any business is better than what SCO has been doing lately, all you need to do is take a look at their stock, which has plunged deeply – so far in fact, I don’t think they will ever recover. I see strange links on SCO’s website, do a whois on the domain the links point to, and discover that the people buying the text link ads are actually SCO resellers in the United Kingdom. If you found this article interesting, consider subscribing to my RSS feed. Tomorrow is unofficial “Linux Nation” day… I’m excited. There’s been plenty of news this week.